At Hyde Park Veterinary Clinic we know how much your pets mean to you. We also know that animals play an important part in the community by bringing people together. 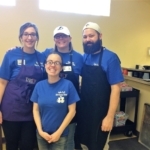 Inspired by the unconditional love and support pets bring to us every day, the staff at Hyde Park Veterinary Clinic wanted to give back to the community by volunteering this weekend at Trinity Café. Trinity Café is a free restaurant that serves nutritious and hearty meals to the homeless and the hungry. Our staff had an amazing day volunteering at Trinity Café and truly felt the joy of being able to give back to a community that has done so much for us. Thank you Trinity Café for all that you do! In November Dr. Jensen continued her international efforts to help spay/neuter dogs and cats in impoverished countries by traveling to Nepal. While there, she and her World Vets team were able to spay and neuter 274 dogs and also provide emergency care for a few sick animals. Below are a few pictures of the World Vets team as they spent days trapping dogs and doing all they could to help ensure the safety and well-being of their patients. In October of 2018 Hyde Park Veterinary Clinic’s Dr. Jensen, Dr. Mueller, and technician Sarah flew to St. Lucia to work with World Vets to provide free veterinary care for the animals of the island. Over the course of just a few days, the team was able to provide medical assistance and spay/neuter 364 cats and dogs! We are so proud of our doctors and technician for working so hard and making a positive impact on the lives of the animals and people of St. Lucia. Community outreach is very important to us! We enjoy participating in local events dedicated to helping improve our society and fostering a sense of unity. In March of 2018, the staff of Hyde Park Veterinary Clinic participated in DogFest 2018. The event was to raise funds for Canine Companions for Independence, a US based 501 organization that trains and provides assistance dogs free of charge! Through our fundraising efforts we were able to raise $2,200 for the organization and we really enjoyed our beautiful day in the park!